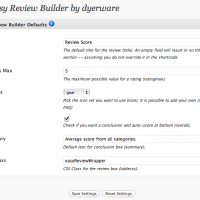 Easy Review Builder is a WordPress plugin for adding a review summary table within your post or page. You insert one with a simple shortcode notation. It is a flexible shortcode that you can apply to a wide range of review formats. Easy Review also looks great on mobile devices and themes such as WPTouch. View this post from your iPhone or other mobile device to experience the proper scaling. A review consists of an optional title, one to eight review categories, and an optional review summary. The review category is where all of the action is. A category is a topic under review such as (for a game) graphics or sound. You provide the category title, category rating (from 0 to your rating max… the default range is 0-5), and a category justification sentence describing why you gave the value. Typically the category summary is a short sentence or paragraph that can recap some key points from the review above. A review table can optionally be followed by a summary conclusion line. 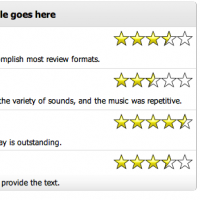 The review summary rating is an automatically computed average of your provided category ratings. You can provide your own summary sentence (or paragraph). These are in the form of catXtitle, catXrating, and catXdetail where X is a number from 1 to 8. Other things you can add that are optional include a title for the review box, and a summary for the conclusion section of the box. These are called title and summary respectively. If you do not want the conclusion you can turn it off by setting “overall” to “false”. Create up to 8 rating categories, more than enough to accomplish most review formats. While voiceovers were charming, the game really lacked in the variety of sounds, and the music was repetitive. Where the sound and graphics faltered at times the gameplay is outstanding. This optional summary is automatically calculated. You just provide the text. Terrible. As soon as I unplug it the laptop shuts down. Amazingly affordable. They probably saved costs on the battery. The plugin currently comes with four icon sets, the default of which is the traditional yellow star. Use the icon parameter to change it. You can even create your own set (see the Easy Review Builder FAQ). Easy Review Builder now comes with an administration panel for setting some defaults, such as your icon choice. Settings in the GUI are overwridden if they are specified in the shortcode. So for example, selecting the icon set “bluestar” in the admin panel and NO icon setting in the shortcode will result in the bluestar icons. It is very important that all of your parameters appear on one line and are all lower case. The plugin has had an addition made to detect malformed arguments and abort processing. This helps you recognize a formatting problem. If you experience this, you will see the following text along with some help information on your post or page: “EASY REVIEW BUILDER SHORTCODE ERROR”. Description: The title of a category to list. X = 1-8. Description: A paragraph to hit home your thoughts on this category.. X = 1-8. Description: The star rating for this category. X = 1-8. Description: If true, a star rating computed average will be made in the conclusion. Description: The final wrapup text. It will only be shown if overall is true. Description: The number of starts your review system is based on. The default is 5. Description: A set of CSS definitions to apply to the DIV with which the table resides in. Email us any CSS tweaks you think we should make as the default. Flexible CSS configuration options, user-selectable star icons, and a shortcode gui builder. Your thoughts are always welcome! Please post here any issues or suggestions. Thanks for sharing this very useful plugin, but I can’t get it working. I installed the plugin, and I copied the code you show in this post (or a changed one made by myself) but nothing happens. My mistake for sure. Hello im new and i was wondering where you put the code. was it under theme editor then you select what you want to be reviewed (example: single post) then wrap that in … ? then where would i place [EASYREVIEW (summary)]? I’m sorry, now I could solve the problem. I inserted the code in a post under the “HTML” mode and it is working correctly. Is there are way for you to integrate it on the edit-post page, so the user basically has to click on a button to insert tags or could could you code an extra box below the editbox that adds the the tags when the post gets published? I am not sure what you mean by tags… but if you mean the shortcode parameters, thats definitely in the plan. There will be both admin and post integrated helper sections. Right now we have to get out a new version of flitter (1.6) and a minor chart builder update… but we definitely intend on adding the gui assist. It helps to wring out the features with the community before you build the gui, so thats why its manual at the moment. Thank you for the quick reply! Yes, sry i was in a hurry, of course i meant shortcode. It’s really a great tool and i prefer it over GD-rating, wich is way to bloated for my taste and takes about 4mb ram. I’m on shared hosting and since wordpress already uses 20mb+ i can not install every plugin i would like to. I deinstall everything over 100kb. I was wondering does this plugin allow all registered members to post reviews so the initial poster can create the review then users can also generate their reviews and build a consensus? Anybody can author a review but it does not have a voting mechanism. Very lightweight plugin. There will be a GUI assist soon to help the creation process. Is this plugin compatible with WordPress 2.9? I get an error every time I try to activate it which says “Plugin could not be activated because it triggered a fatal error.” I can send you the exact code via email if you want to see it. Yes, this very site is running 2.9, but to make sure I tested deactivation and activation which seemed ok. Is your version of PHP >= 5? Just found out it’s PHP 4. The host has some code to add to the .htaccess file to force it to use PHP 5 (1and1.com), but so far I haven’t gotten it to work that I can verify, and certainly not with the plugin. bummer… sorry I don’t know much about PHP 4 vs 5, nor do I have it available to play with in my environment. If you come across some PHP tweaks that help I’ll baseline them. I actually have the exact same fatal error come up… I think it’s because I’m on php4 not php5 (takes a few hrs for my hosting to change it over aparently). hopefully the change to php5 will get rid of that error. If I understand you right, the plan is to create a GUI assist within the new post/edit post backoffice editor. Just have not had time to get back to it yet, but its coming. this isnt working for me just yet (assuming due to being on php4 not php5), but I’m curious if this plugin also allows other people to vote ? I’m doing a product review website where I want people to be able to vote on different categories. This is a great plugin, very well designed. Is there anyway that It can be interactive. Meaning you post the categories, and users can rate? Does this review plugin use Microformats? No, but I could add the related class fields in the output. Would that be what you were looking for? Hi. I haven’t yet tried this plugin, but I think supporting the hReview microformat is important for SEO. There’s another review plugin I found that I haven’t really looked at yet either called “hreview-support-for-editor” which supports hReview microformat, so I thought I’d share it in case you can benefit from how they do things. Looking forward to giving your plugin a try. this plugin really helps me a lot, thanks admin. 1.a. find the icon folder, to put my own up and 1.b. what size should the icons be? 4.a. edit the text size and line spacing, and 4.b. put both the title and the detail on one line in some of the boxes. 5. is it possible to change background colors of the header and such? On text spacing and colors, its possible to change them. Start off by copying the css files you see in the plugin folder but name it whatever you want. Then specify this file as your CSS file for the plugin in the admin menu. Its touch and go if you can get the right effect you want, but let me know if you experience problems. Also, the forum here creates trouble tickets behind the scenes that helps me track things a bit better. Never mind i found out already. This is a server especially for php4 scripts. I apologize in advance because I must have misunderstood something along the way. I have inserted the easyreview shortcode with all required parameters. I get the title, but I get no review box to post a review. Is the plgin supposed to insert that review box? Sorry I should have replied sooner. Yes, it should look like the article above. Can you use the forum (http://www.dyerware.com/main/forum/easy-review-builder) to post your shortcode (without the surrounding angular brackets) and the problem you are having? Pretty sure we can figure this out quickly. darn, i thought this was used for allow users to submit reviews sort of like what amazon and dell have. I know you want to keep this simple, but may I suggest you add a voting mechanism? looking for a simpler alternative to GD Star! Yep I keep intending to get back to this plugin. Two things I really want to do are to create a visual editor for entering the shortcode, and some SQL integration, which would play into some user interaction. I cannot say when I would get to it though. do you plan on updating the plugin in future? it would be also great if you could make it possible to review more items in one post. i plan a magazine with products reviews, where i compare products and give each product a ratings. Hello, great plugins but with no improvement in these months. I use actually GDStar but it’s very complicated to do non standard things. You’ll do some update in near future? I was just wondering how to change the default color scheme of the table. I can see from the sample website that they could do it, however, I don’t see that option within the admin panel. A detailed reply would be greatly appreciated! 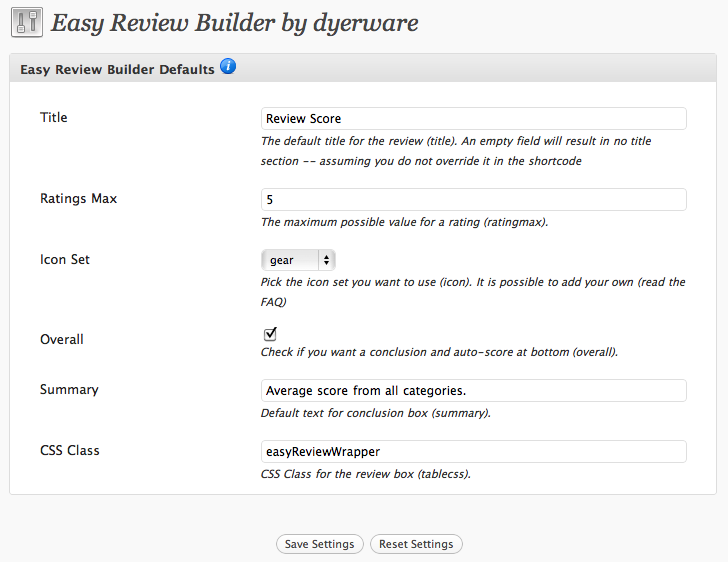 Love you easy review builder. I use it on two of my sites. Any chance of maybe making this into a form that can easily be filled out and then posted? It’s not hard the way it is now, but I am always doing the same types of reviews. It would great to build a template that I can just use every time with some fields to fill in and hit post and there’s the review. Yes, some work was done early this year for easy chart builder (and the idea was to fold it into erb) but the problem was parsing the article to recreate the form when you wanted to edit it again. Eventually all the complex plugins will get this feature. I am hoping the editor updates coming in 3.1 will open some things up. Thanks for the great plugin. I’m wondering if it’s possible to remove the ‘category justification’ field?